The crowd is gathering, bidders are bidding, raffles are pulling. Have you maximized the fundraising potential? Consider this professional advice to skyrocket the auction fundraising in planning, execution and post-event activities. Decisions need to be made prior to the first donation request. Will the auction take place online or at a live event? Going Online can expand the bidder pool. Auction fundraising depends upon bids, bids depend upon bidders. The greater the number of the bidders, the more bidding will take place and the higher the bids. So, How to expand the bidder pool? Go online with the auction. Similar to traditional silent auctions there is a start time, end time, and the bidding process takes place in between but completely web based. Online auctions add a layer of flexibility for both the auction itself and the the participants. Online auctions extend both the time and reach for bidders. The online auction naturally lends itself to online marketing with a direct feed to bidding. The window of opportunity for bidding for an online auction tends to be much longer than an event based function. Extended bidding time boots bidding. Online Auction Accelerators: Proxy Bidding and Anti-Sniping Bidding Online auctions have the added feature of two highly favored bidding options. 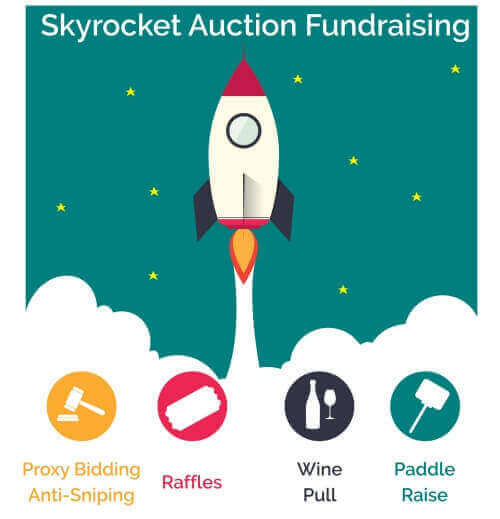 Proxy bidding and anti-sniping not only make the auction fun last longer but increases the bottom line for final bids. During online auctions the bidding fury takes over as the clock ticks closer to closing time. The winner is the one that got that very last bid in at the mere moment before auction closes. The winning bidder is super happy but how much higher could the bids have gone? Online auctions technology has removed the sniper and increased auction proceeds with anti-sniping feature. Anti-sniping accelerates the bidding so more bids can be placed, thus increasing the final bid. Have you ever run an online auction fundraiser and the bids come in s-l-o-w-l-y one by one? Although small increments for online auctions can provide engagement and activity it may not produce the maximum potential for the highest bids. In a standard online auction after each bid is placed the outbid bidder receives a notification but then NEEDS to bid again to back on top, and because people are busy they might forget. Proxy bidding, or a more descriptive term is automatic bidding moves the bidding up efficiently without the bidder needing to be involved on every bid. Proxy bidding accelerates the bidding so more bids go higher, faster. Stating the obvious, live & silent auction is much more of an in-person social event. Many times this includes keynote speakers, entertainment and libations. The fervor at a happy event lends nicely to encouraging greater philanthropy with a hint of peer pressure. In addition to the standard silent auction the live auction portion of the event can really excel the income. Using a live auctioneer emcee can have a multifold purpose: pre event promotion and the power of persuasion during the event. Success lies in the preparation. A professional auctioneer is not necessary but choosing an auctioneer or emcee should be done with care. Consider the complexity of the auction items. Consider using a member of the charity group, a local radio or media personality. An emcee with a strong social presence and friendly personality help the donors engage. Many times looking within your group will mine a gem of emcee that already affiliated and personally invested. Select live auction items with a variety of price points. Begin with lower value items to engage more bidders. Choose auction items that are NOT a commodity type item instead select one-of-a-kind or unique experience items that have a broad audience interest. Be creative! The live auction is only successful when at least 2 or more bidders are actively engaged, thus the goals is to attract live auction bidders in the marketing prior to the auction event. Highlight the live auction items through the auction website, outbound emails, paper flyers and invites as well as at the actual event. Promoting and displaying live auction items in advance to elevate interest level will increase the bidding activity. With the spirit of giving in the air many dollars can be raised with adjunct fundraising activities surrounding the event. Partygoers will quickly pull out the credit card for beer, wine, raffles and straight-up donations. Don’t limit the auction to auction items only. Many donors are attending to be social and support a cause with a straightforward donation. Offering drink tickets or sales can boost revenue. Making it an activity can enhance the ‘fun’ factor meaning more money is willing to be spent to support the cause. Blind wine pulls are favorites. There are no losers because each pull receives a bottle of wine, the lucky ones win an expensive bottle of wine. Prepare this by choosing a variety of low, medium and a few higher priced wine bottles. The pull is set a flat price balancing the drive for interest and risk-reward. The partygoer purchases a wine pull, chooses a wrapped bottle to enjoy at the event. Friendly reminder, know the rules, raffles are considered a game of chance and may be regulated. Raffles Increase the Bottom Line. When selling tickets do so at single ticket rate. Encourage greater giving with ticket packages. For example $5=1 or ticket $20=5 tickets. Consider the audience's past spending habits to determine the starting price and increments for raffles. Raffles can be clever and profitable. There are many raffle variations such as 50/50, heads-or-tail, chinese and mystery box. Each raffle type exciting and different. If the agenda does not include a Paddle Raise then you are probably leaving some funds on the table. The paddle raise is typically initiated about ½ way into the event. The emcee announces how what project the paddle raise will fund. Take the opportunity to really tell the story, show photos or videos to make an emotional connection with the audience. Then announce “please raise your paddle to donate X amount. Start with the highest figure you think you can get at least 1 paddle to raise. Then incrementally LOWER the donation amount and hopefully RAISE more paddles. Spotters will be needed to track the process. Thank you tasks should be pre-planned before the auction even starts. After the auction concludes and the dust settles now it the time to thank everyone involved in the auction. This means donors, bidders, volunteers, board, chairpersons. No matter if a person spent 5 minutes or 500 hours helping a thank you is always in order. In the thank you note share your success, remind them to stay connected. Post auction is the appropriate time to remind bidders of matching gifts. Just in case you didn’t know, matching gifts are a type of corporate giving program that essentially doubles an employee’s contribution to a qualifying nonprofit organization. If the donation and your nonprofit are eligible for a matching gift, your organization will receive a check from your donor’s employer. Most matching gift programs will double an employee’s charitable contribution, but some offer matches at a 3:1 ratio, tripling the original donation! The biggest reason many donors don’t submit matching gift requests is that they simply don’t know that such programs exist. Double the Donation is the expert on this subject! Stay connected with the bidders through multiple communication channels. Cross promote email and social networks to continue telling the story. Be transparent about funds raised and how the funds are being spent. Don’t just tell, show with photos and videos. A good goal is to to convert the short term bidder into a long terms supporter. The combination of thanking, showing can the beginning of a continued relationship. To maximize the auction fundraiser it is imperative that the entire auction fundraising event be organized. From the first donation request to the last receipt and all the bidding and communication in between should be planned and purposeful. Layout timeline, checklist and volunteer duties to coordinate all auction activities. Do use a formulaic system to ask for donations, record donations, manage bids and close out seamlessly. The more organized the auction the higher the satisfaction rate of the donors and bidders. Happy bidders will come back and support the cause again and again.